The Ribbon Rouge Foundation is convening ongoing and continuing dialogue: Through the Listening Campaign, we are facilitating opportunities to bring multiple stakeholders across multiple sectors and disciplines of society and from three levels of government, from diverse community, ideological and religious perspectives together. This initiative will foster learning and deep generative listening to assets, aspirations, values and needs of diverse African communities and in so doing sustainably co- create systems level interventions to tackle structural determinants of health inequity in order to meet social determinants of health needs for Africans by Africans. Ribbon Rouge Foundation will be presenting to the Women's Advocacy Voice of Edmonton (WAVE) Committee and sharing about our work with the Listening Campaign. Visit the Origins Exhibition during the weeklong string of kaleidoscopic performances and shows of Norquest's Inclusion Fusion, in line with the International Day for the Elimination of Racial Discrimination. 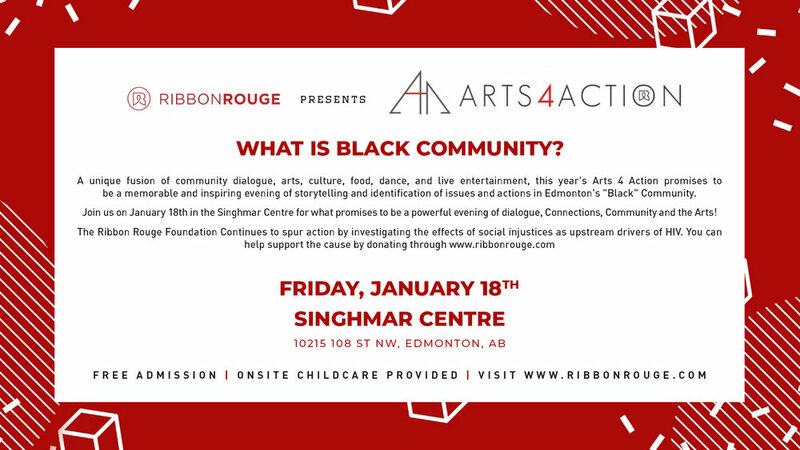 The Origin's Exhibition features expressions of origin stories shared through black history month by Four Black Edmontonians, curated by the Ribbon Rouge Foundation's Artist Collective. Ribbon Rouge Foundation will be presenting a digital story of women living with HIV in Edmonton to pharmacy students in the Infectious Diseases II class as an introduction to stigma and trauma informed care from these lived women's experience. Moréniké Ọláòṣebìkan, from Ribbon Rouge Foundation will be expanding on the pharmacist's role in stigma reduction, harm reduction and trauma informed care. She will also be providing conversation starters around sexual health for practising community pharmacists. Join us for a screening of a deliciously short film featuring panel discussions at Norquest on topics around black history framed through a lens of new African Immigrants' experiences. Bringing members of the African, Caribbean and Black community together from across the province to discuss the role of health inequity and other social determinants of health predispose members of this community being vulnerable to STBBIs, particularly HIV. Fashion, Art, Music and a Lively Discussion. The Ribbon Rouge Foundation will table at the Women's Symposium to share more about what we've been up to and what our plans are for the foundation as we shift into deeper community engagement. Film screening and interactive discussions with academic & community panel. Opening Reception: Mix, Mingle, Drink some wine and meet some amazing local talents. Meet students from our Art Illustration Mentorship as well as Artists in Residence at the Lotus Gallery! The Ribbon Rouge Foundation is sending our collection on a trip across the city in a travelling exhibition; and our first stop is at the Lotus Gallery. Stop by, buy ART for Zero HIV.